Do you think that feeding hay or oat is enough for your horses’ dietary demands? A diet of only forage or oats doesn’t offer optimal nutrition for their development. That’s why you need to find the best horse feed to supply sources of minerals, vitamins, and protein. And in our table below, we will give you a detailed look at the good products to help you take the right care of your horses. Down here to know now! Q1: When should I feed the horses? Q2: How much should I feed a mare that is feeding a foal? Q3: How much should I feed the horses with particular demands? Q4: Does feeding more grain (or protein) make your horse “hot”? Q5: How to concentrate on feeding for my horses? 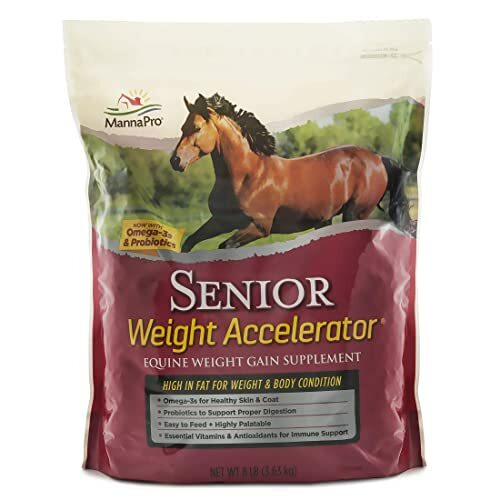 If you are looking for the best horse feed for senior horse, Manna Pro Senior Weight Accelerator is what you need, guys. This supplement has high calorie and fat levels for gaining weight as well as body condition. Since it’s formulated for senior horses, it also includes a variety of necessary vitamins and minerals to offer excellent benefits. The Omega 3 acids from flaxseed are good for healthy coat and skin. Relying on that, your horses’ coat will look better and won’t get any skin issues. This product contains probiotics to give your four-legged friends proper digestion and biotin for their hoof development. And depending on your equines’ demands, you can feed them by mixing into the grain or top dressing at the rate of 2 to 10 ounces per horse every day. Make sure you check the chance of loose stools within two weeks. If it happens, you need to decrease the amount. Some report that their horses don’t like the taste. But you can try to hide it in a strong-tasting feed. With 100% dry vegetable fat, Cool Calories 100 from Manna Pro is suitable for all kinds of equine. This concentrated energy supplement also offers calories for underweight horses and over-all body condition. Thanks to the appearance of fatty acids, your four-legged friends get a full and glossy coat for sure. But what makes this product outstanding is that it’s high in fat for cool energy. And that makes it become the best horse feed for performance horses. 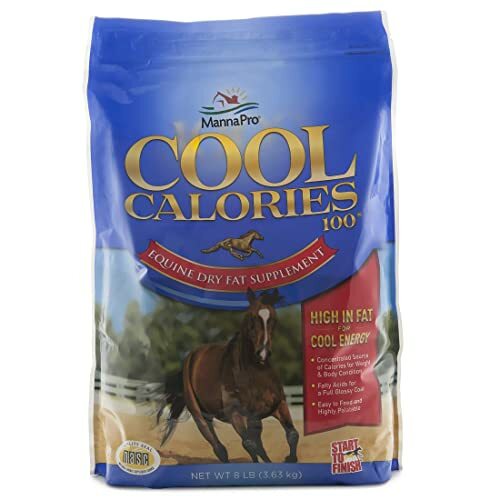 Simply mix the Cool Calories 100 into the grain portion at a rate of 2 to 4 ounces per horse daily. Or you can enhance the amount if you are feeding your underweight performance horses. Aside from offering the original equine superfood supplement, The Missing Link Equine Plus Formula is ideal for joint support. It includes healthy glucosamine, omega fatty acids, fiber, and Phytonutrients for aiding general health. 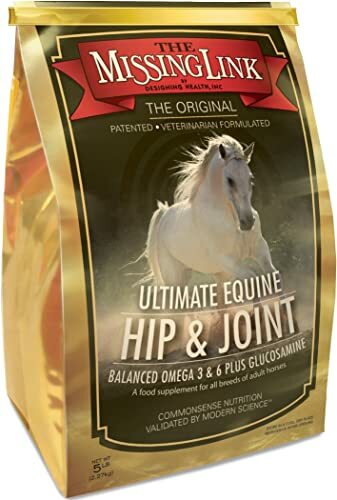 This formula is also designed to supply the necessary nutrients often missing from grain or hay to improve joint health. What’s more, this feed supports fat absorption in the tissues to enhance stamina levels. Overall, The Missing Link includes the right ingredients to help your horses grow strong. But you might consider before buying in case your budget is limited. 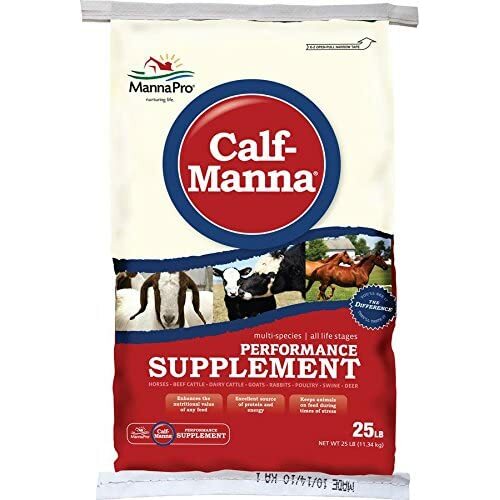 If you need the feed for all life stages with an affordable price, Manna Pro Calf-Manna Supplement is the answer at this time. Moreover, you are able to feed the mare from the start of her early development stage. It’s even okay to feed her right after birth by combining it with other feeds or milk. Indeed, the Calf-Manna supplement is helpful for immune health and energy production. It’s because this good feed includes high proteins, oats as a natural ingredient and amino acids. It also contains the digestive carbohydrates that helps animal gain more energy. 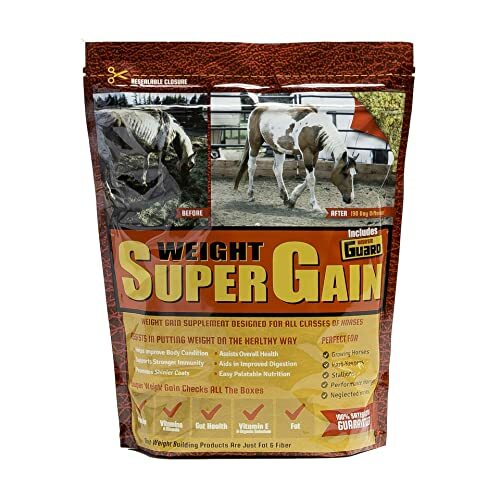 With no sugars and starches, Horse Guard Super Weight Gain is extremely suitable for equines that are severely underweight. This feed doesn’t only offer them the necessary amount of fat and fiber but also lots of minerals and vitamins. Bacterial and yeast inoculants also help to enhance their gut function and digestive system. Plus, protein is required to develop their energy level while vitamin E and organic Selenium prevent them from getting stressed. In case you have four-legged friends in such conditions, this kind of feed will offer everything they need to get back to health for sure. Since this product works quickly and effectively, you soon get the proper result. Aside from introducing the good products above, we also mention some considerations when you are contemplating feeding your horses. Let’s bring out the meaning so that you can understand better! Most horse feeds are made to satisfy the particular nutrient requirements of life stages and activity levels of equines. And they often specify on the packaging. When examining your horses’ activity level, you need to feed reasonably. It’s because overfeeding energy might make them “hot” and gain undesired weight. In case this happens, avoid reducing the amount under the recommended feeding rate. Or your horse won’t get enough nutrients he needs. It’s best to change another lower energy feed and check the result. If your four-legged friend has a particular health issue that can be affected by his feed, you need to examine the info from the bag or your veterinarian carefully. For instance, using the Cool Calories 100 for horses with a history of feed-related laminitis is ideal. Last but not least, you should consider your budget. Since the features and benefits of feed might increase the cost, you have to ask whether you can buy this product at the suggested feeding levels. Remember that the feeding rates change between the products and it might influence the cost to feed the horse every day. The basic nutritional requirements such as vitamin, minerals, protein, energy, and water are a vital part of any feeding plan. Vitamins and minerals are one of the easiest to control. They are often met with good-quality hay. Or a pure vitamin supplement together with a mineral block in your horse’s pasture is enough. The intake of protein should be 10 to 12% of his total diet. Make sure to check the protein levels in the horse feed because he isn’t getting enough if being fed less than 10% protein. Energy is the number of calories the horses take in, whether it’s from hay, pasture or supplements. Giving enough energy helps them to perform their job and maintain a good weight. The last thing is the water. Just ensure that they drink enough water and it must be clean. Keep in mind that your horse’s stomach is designed to contain 2 to 4 gallons of material at any given time. And in the natural environment, he needs 16 hours each day of grazing. So, it’s best to feed him small and frequent meals in case he’s not grazing all day in the pasture. Ideally, if your horse is kept on or live inside a dry all day, you should feed small amounts about 4 times per day. In case it’s not possible, you can offer hay in slow-feed nests to make feeding time longer. The truth is that feed companies have done an excellent job in recent years of introducing safe and well-formulated rations. And there is no reason why you don’t take advantage of their expertise. All the products that we’ve mentioned above are guaranteed to give the best results for your equines. For horses with ulcers, you need to feed them right up to the time of competition. It’s because hay will buffer their stomach from excess acid. It’s best to use alfalfa hay instead of grass hay. Horse feeds, or grain that is high in starch should be given at least 4 hours before competition or exercise. Avoid feeding over 6 lbs of grain or horse feed in one time or your horse will get much strain on their hindgut. This causes fermentation and a rise of intestinal acidity. Moreover, it enhances the risk of colic and digestive ailments. Mares need about 44% energy requirements when they are feeding a foal. During their first three months of lactation, they might give up nearly 3% of their body weight per day in total milk production. That means a 1,100-pound mare will give up almost 24 pounds of milk every day. Therefore, you need to feed them about 30 lbs of hay and 20 lbs horse feed daily. If your four-legged friends are sensitive to dietary starch, you should feed them a diet that is high in fat rather than starch. For horses with common respiratory issues, they need to eat quality wood shavings instead of straw. It’s because straw tends to mold with ease. Even if you cannot smell or see it, straw often includes mold spores that might irritate your horses and make them cough. Protein is necessary to repair tissue tear and wear and offer energy. If your horses obtain less protein, healing wounds and recovering from exercising is tough. But whether or not feeding more grain makes them “hot,” you need to base on the amount of non-structural carbohydrates that he needs. Note that different grains come with varying amounts of NSC. Among, corns (60%) and oats (52%) have the highest one. You have to base on your horses’ breed and discipline to find the right horse feed regiment. For example, endurance horses require a diet that includes a 75-25 ratio of 75% fat and 25% glucose. Hunters need 50-50 while three-day eventers ask for 67% fat and 33% glucose. Among top 5 picks above, our best horse feed for equines of all life stages will be the Manna Pro Calf-Manna Supplement. Not only does it offer a reasonable price but also give spectacular results thanks to the appearance of yeast culture, amino acids, proteins, etc. It’s a double performance feed that is good for weight gain as well as performance horses. Generally, you’re guaranteed to get a good deal if ORDERING this product. Of course, don’t mind asking any question in case you want to know more about this topic. Or you can consult other posts to find more good feed for your horses such as best horse calming supplement. Once again, thanks for reading, guys!